Author: Richard Upsher Smith, Jr. This book is a glossary of terms in grammar, rhetoric, and prosody that students of Greek and Latin commonly encounter in their first three years of study. While English grammar is the focus the links with Greek and Latin grammar are explained and some Greek and Latin constructions that do not occur in English are defined. Common rhetorical and prosodical terms encountered in the annotations on Greek and Latin texts are explained and illustrated with Greek and Latin quotations. The principle reason for the study of Greek and Latin languages is that so much of the English language is derived from them. A strong secondary reason is to be able to read the great authors and poets of antiquity in their original tongues because translations (even the best of them) can't always do full justice to their literary beauty and passion. 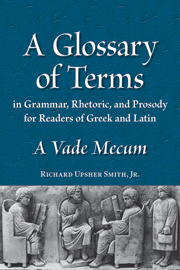 "A Glossary of Terms in Grammar, Rhetoric, and Prosody for Readers of Greek and Latin: A Vade Mecum" by Richard Upsher Smith Jr. (Professor of Classics, Franciscan University of Steubenville, Ohio) is a concise 140-page instructional text that offers students tables of verbal aspect, types of nouns, English personal pronouns, English relative pronouns; the English verb 'to be'; quotations from Greek, Latin, and English masterpieces; and all AP Vergil rhetorical and prosodical terms. Solid scholarship, deftly presented, make "A Glossary of Terms" an invaluable addition to personal, professional, and academic library Greek and Latin instructional reference collections.